On Friday, 20 October 2017, CBC journalist Jacques Poitras reported on a strange, ambiguous press release from the Liberal Premier of New Brunswick, Brian Gallant, and speculated what it might mean. The original press release said that the Premier would meet with the Lieutenant Governor on Monday. This coy phrasing kicked off speculation that the Premier might intend to advise an early dissolution. However, Poitras correctly surmised that the cryptic wording alluded to an upcoming prorogation, short intersession, and new Speech from the Throne. On Monday, 23 October, Brian Gallant distanced himself from this furore, expressed surprise over the speculation of early dissolution, and professed his ignorance of and irresponsibility for the media advisory that came from his own office. “I didn’t write the media advisory,” he said. Gallant added, “I’m not the one who writes the media advisories, so I wondered how all of this happened, and I asked how it happened.” In fact, Premier Gallant must take responsibility for his political staff, and Gallant most certainly is responsible for the press releases that his press secretary publishes. The Leader of the Progressive Conservative Party, Blaine Higgs, took the unusual step of issuing a counter-press release of his own condemning something that had not occurred. In fact, Premier Gallant would not have violated the Legislative Assembly Act if he had advised Lieutenant Governor Roy-Vienneau to dissolve the legislature one early. Blaine Higgs showed his incoherence in this interview with Steve Murphy on Monday, 23 October 2017. Central and Western Canadians might remember Murphy as the interviewer who leaked that infamous out-take footage of Stephane Dion in 2008. 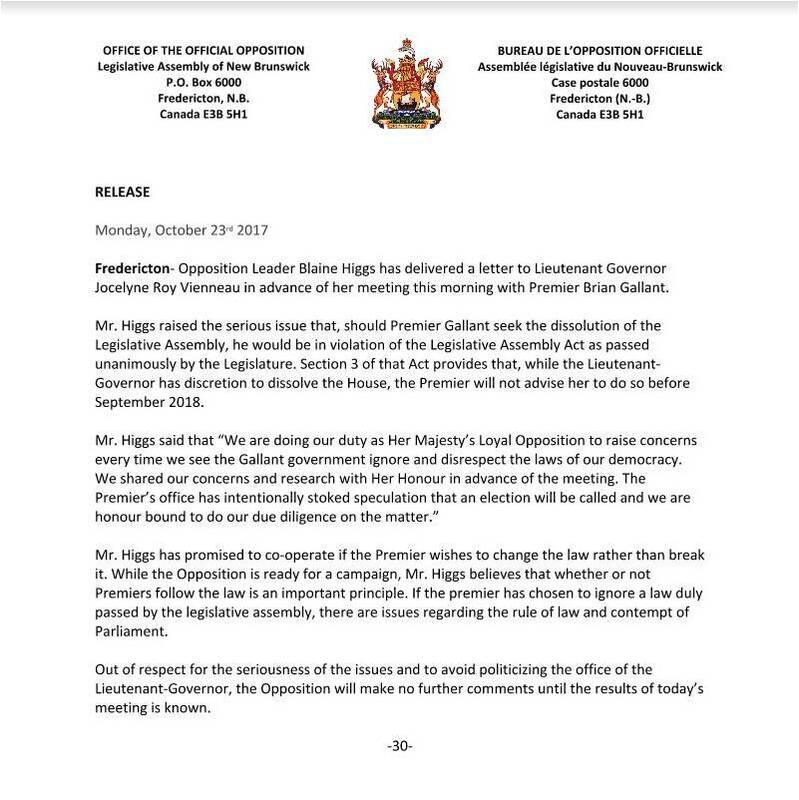 The logical conclusion, based on Higgs’s own statements in the press release and here, is that he was disappointed that Premier Gallant did not break the law. Murphy also saw this obvious contradiction and pressed Higgs to reconcile the contradiction between what he wrote in the Progressive Conservative Party’s press release and what he had just said. From this confused mess, we can discern the germ of an argument. Essentially, Higgs accepts the Heardian Doctrine that fixed-date election laws impose a conventional restraint on when the premier can advise the governor to dissolve the legislature but not alter the governor’s authority over dissolution itself. As I’ve demonstrated in my article, “When the Bell Tolls for Parliament: Dissolution by Efflux of Time,” this is false and logically incoherent, both in principle and based on the five precedents for early dissolution notwithstanding fixed-date election laws which have accumulated since 2008. At its core, Responsible Government is a trinity (three in one) of responsibilities: ministerial responsibility to the Crown, individual ministerial responsibility before the Commons, and collective ministerial responsibility & solidarity before the Commons. In this manner, Responsible Government therefore preserves and fully incorporates the medieval principle of Royal Infallibility and reconciles it with liberal democracy and self-government: the Queen can still do no wrong because it is the ministry which takes responsibility for all acts of the Crown, for good or ill. It also means that the Government must command the confidence of both the governor, who grants Ministers the authority to govern under the Crown, and of the assembly, which must pass supply or else force either the Government’s resignation or dissolution and fresh elections. Responsible Government means that “Ministers of the Crown take responsibility of all acts of the Crown” and that the governor acts on and in accordance with ministerial advice, save for exceptional circumstances. These acts include accepting responsibility for one’s own appointment as first minister, the dismissal of one’s predecessor, and for summoning, proroguing, and dissolving parliament. Where the Constitution Acts mention the governor general, the prime minister by convention tenders and takes responsibility for that advice; where they mention the Governor-in-Council, the cabinet collectively tenders advice and takes responsibility for those acts of the Crown. The Constitution of Canada includes both the Constitution Acts and the constitutional conventions of Responsible Government. Combining the written constitution with the conventions of Responsible Government, we derive the following formulation: the governor general summons, prorogues, and dissolves the Legislature on and in accordance with the advice of the prime minister. Logically, therefore, we cannot drive a wedge between the Queen and governors on the one hand and the first minister and cabinet on the other because under no circumstances could the Queen or governors act independent of ministerial advice on matters of state, and only under exceptional circumstances could the Queen or governors act contrary to ministerial advice. The Constitution of Canada includes both the Constitution Acts and the constitutional conventions of Responsible Government. Logically, Parliament therefore cannot drive a wedge between the governor general, who carries out advice in the Queen’s name, and the prime minister, who advises the governor general and derives his commission of authority to govern from him, or otherwise attempt to draw a false distinction between the two, because under no circumstances could the governor general act independent of ministerial advice on matters of state, and only under the aforementioned exceptional circumstances could the governor general act contrary to ministerial advice. These previous two paragraphs come into play in the analysis of New Brunswick’s fixed-date election law. All fixed-date election laws in Canada (federally and provincially) contain either a non-derogation clause or an affirmative clause emphasizing that the Governor General’s or Lieutenant Governor’s authority over dissolution remains intact. The fixed-date election laws of most of the other provinces state that “The Lieutenant Governor-in-Council” shall issue the writs on a given state, by order-in-council, or they simply state that the general election shall occur on x date every four years, which means, by necessity, that the Lieutenant Governor-in-Council must issue an order-in-council or proclamation for the dissolution of the legislature and the return of writs — even if the statute doesn’t specifically mention the Lieutenant Governor-in-Council in that section. New Brunswick’s fixed-date election law, now contained in section 2 of the Legislative Assembly Act, uses unique wording: instead of simply stating that a general election shall be held on x date, or stipulating that the Lieutenant Governor-in-Council shall issue an executive instrument, New Brunswick’s statute specifies that the Premier shall advise the Lieutenant Governor. I would argue that these three formulations are all equivalent of one another and that nothing in the unique wording of New Brunswick’s statute alters the established constitutional positions of the premier and lieutenant governor, as Andrew Coyne, Emmett Macfarlane, and Philippe Lagasse were discussing. 2(1) A Legislative Assembly of the Province shall not be affected by the demise of the Crown. 2(2) The present and every future Legislative Assembly shall continue until dissolved by the Lieutenant Governor. 2(3) Nothing in this section affects the power of the Lieutenant-Governor to prorogue or dissolve the Legislative Assembly at the Lieutenant-Governor’s discretion. (b) thereafter, on the fourth Monday in September in the fourth calendar year following the ordinary polling day for the most recently held provincial general election. 2(5) If the Premier is of the opinion that a Monday that would be an ordinary polling day under subsection (4) is not suitable for that purpose because it is in conflict with a day of cultural or religious significance or a federal election, the Premier may choose an alternative day in accordance with subsection (6) and shall provide advice to the Lieutenant-Governor that the provincial general election be held on that day. (b) if the date of a provincial general election under subsection (4) is not suitable because it is in conflict with a federal election, the fourth Monday in August or the fourth Monday in October in the fourth calendar year following the ordinary polling day for the most recently held provincial general election. If anything, the wording in New Brunswick’s statute simply acknowledges the existing practice more openly and honestly that the “Lieutenant Governor-in-Council” formulation or the “a general election shall be held on x date” formulation. The one potential difference lies in what kind of executive instrument promulgates the dissolution of the legislature. At the federal level, the prime minister alone advises the governor general or Queen through an instrument of advice, which emanates solely from him and does not require any input or counter-signatures from cabinet. But the cabinet, with a minimum quorum of four, must approve an order-in-council before the Governor General promulgates it. As such, the Queen or Governor General act through the prime minister’s instruments of advice, while the Governor-in-Council acts through cabinet’s advice and order-in-council. The wording of New Brunswick’s Legislative Assembly Act hints at the possibility that this province might also differentiate between types of executive instruments where the Lieutenant Governor acts on the Premier’s advice alone through an instrument of advice, while the Lieutenant Governor-in-Council acts on the advice of cabinet more broadly through orders-in-council. Alternatively, the premier might have co-opted the order-in-council so that this one executive instrument serves both purposes. Section 13(1) of New Brunswick’s Elections Act does state that “Every election shall be commenced by an order of the Lieutenant Governor-in-Council”, and section 13(2) specifies what the order-in-council pertaining to the writs of election must do. But this would also conform to the procedure for federal elections, which I also described in “When the Bell Tolls for Parliament: Dissolution by Efflux of Time”. 3. a pro forma proclamation summoning the first session of the next parliament, which the Governor General promulgates in accordance with the Prime Minister’s instrument of advice. Something similar happens in New Brunswick. The Royal Gazette of New Brunswick records these same three steps but within one proclamation, in which the Lieutenant Governor indicates that he has dissolved one legislature, signed an order-in-council for the writs of election, and summoned the first session of the next legislature on x date. While the Royal Gazette does not include the order-in-council issued under section 13 of the Elections Act, it does allude to it within this proclamation. The Executive Council Office of New Brunswick maintains the list of orders-in-council, instead of the Royal Gazette. Order-in-Council 2014-346 promulgated the advice that the Lieutenant Governor issue the aforesaid proclamation. The form “the premier recommends to the Executive Council” shows that the premier initiates the advice and makes the decision on dissolution. The only possible difference between these three formulations pertains to whether dissolution can occur by efflux of time or not. 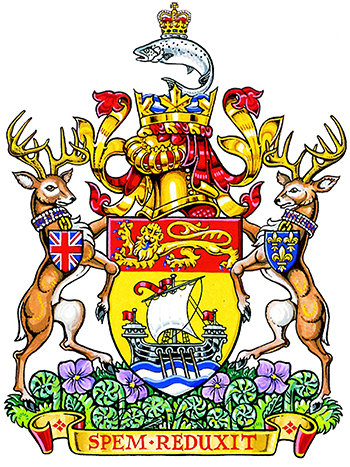 It could be argued that New Brunswick’s unique wording that “The Premier shall advise to the Lieutenant Governor” precludes the possibility of dissolution by efflux of time (i.e., when dissolution occurs automatically, subject to statute and not subject to ministerial advice, because it has reached its maximum lifespan), while the other two formulations would potentially allow for dissolution by efflux of time. Whether fixed-date election laws say that “The Lieutenant Governor-in-Council” shall issue an order-in-council dissolve the legislature and providing for the return of writs, or that the Premier shall advise the Lieutenant Governor to issue a proclamation dissolving the legislature and providing for the return of writs, or simply that “a general election shall be held” on x date, they all preserve the established constitutional positions of the governor and first minister. They also all show that Canada’s fixed-date election laws only impose a hard limit on the maximum life of a legislature but do not set a minimum lifespan. The Early Dissolution That Wasn’t of 2017 shows once again that the press has finally accepted this fact. Poitras and others noted matter-of-factly that Premier Gallant could have opted for early dissolution even though his government did not lose the confidence of the assembly. I elaborated on these arguments of minimum and maximum lifespans of Canadian legislatures at great length in my piece, “When The Bell Tolls for Parliament: Dissolution by Efflux of Time,” which appeared earlier this year in The Journal of Parliamentary and Political Law. In addition, I have tracked this issue here on Parliamentum since 2011 and chronicled the shift in media coverage and understanding of this issue, which started around 2013-2014 when Premier Marois of Quebec and Premier Wynne of Ontario undertook early dissolutions without first having lost votes of non-confidence in the assembly. Since the Canadian model of fixed-date election law first appeared in British Columbia in 2001, five first ministers have advised early dissolution notwithstanding the law: Prime Minister Harper in 2008, Premier Marois in 2013, Premier Wynne in 2014, Premier Prentice of Alberta in 2015, and Premier MacLauchlan of Prince Edward Island in 2015. When Prime Minister Harper followed this course in 2008, critics screamed and jumped up and down, “He broke his own law!”, which is false. Thankfully, this factually incorrect nonsense did not enter the debate in 2013 and thereafter. Unfortunately, as Blaine Higgs demonstrated, politicians in opposition still cling to the Heardian view that these fixed-dated election laws somehow impose conventional limitations on the Crown’s authority over dissolution and that early dissolution “breaks” these laws. Premier Gallant of New Brunswick did not become the sixth first minister to advise early dissolution notwithstanding the so-called fixed-date election laws, but some other first minister eventually will. And when that happens, you can count on me to reiterate these points — because they apparently always bear repeating. 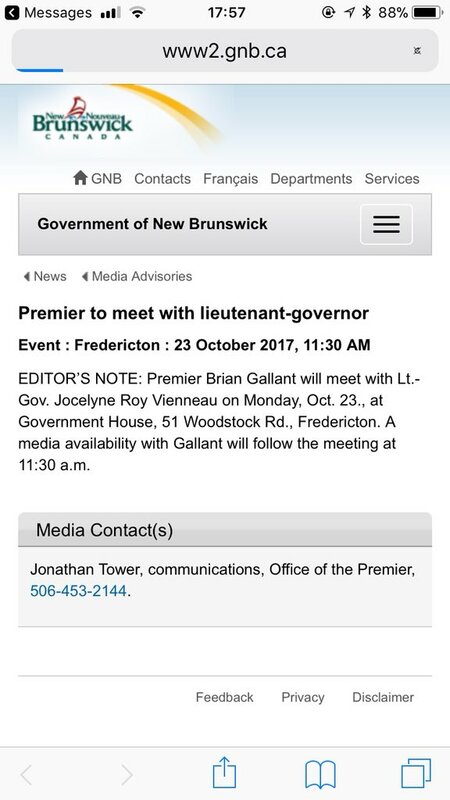 Jacques Poitras, “Brian Gallant to Visit Lieutenant-Governor Monday,” CBC News, 20 October 2017. Blaine Higgs, interview with Steven Murphy, CTV Atlantic, 23 October 2017. Jacques Poitras, “Premier Baffled by Election Speculation, Says That It’s Not His Fault,” CBC News, 23 October 2017. 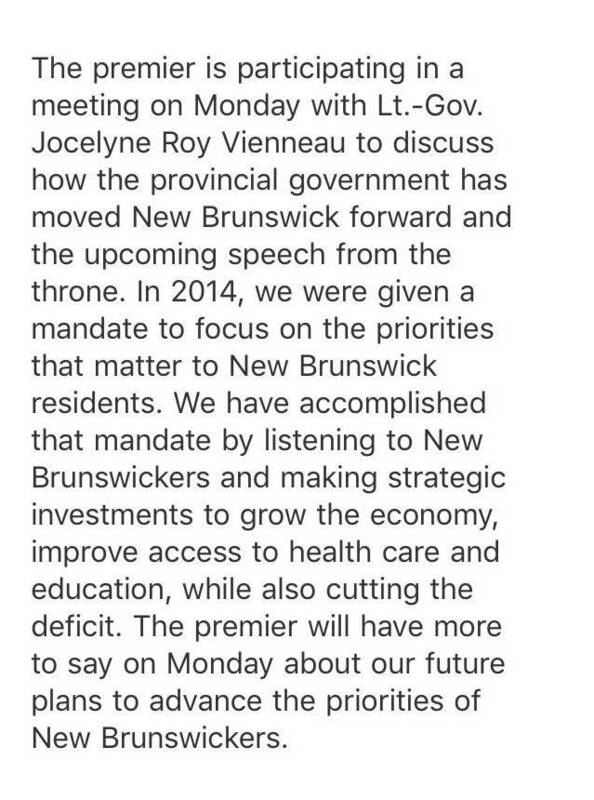 New Brunswick, Office of the Leader of the Opposition, Press Release, 23 October 2017. Robert Macgregor Dawson, “The Constitutional Question,” Dalhousie Review VI, no. 3 (October 1926): 332-337; Eugene Forsey and Graham C. Eglington, The Question of Confidence in Responsible Government (Ottawa: Parliament of Canada, 1985), 16-17. Sir John George Bourinot, Parliamentary Procedure and Practice, 4th ed. (Montreal: Dawson Brothers Publishing, 1916): 102. R. Macgregor Dawson, The Government of Canada. 5th ed. (1970), revised by Norman Ward (Toronto: University of Toronto Press, 1947): 175. Emmett Macfarlane, Andrew Coyne, and Philippe Lagasse, Twitter Posts, 23 October 2017. The essential point here seems to be that the Canadian fixed-term provisions amount at most to an attempt to control a Premier’s actions, but have no legal effect on the constitutional authority of the Lieutenant Governors (or Governor-General) at all. Obviously the aim is to bring about fixed terms through laws bind the premiers, making the act of advising an early election in some sense an illegal act. But it is unclear that there is any penalty on the premier for breaking that proscription, nor that any constitutional court would consider voiding the ‘legal effect’ a premier’s advice to the viceroy. In effect, this position denies that a premier’s advice is even a justiciable action; that the relationship between the premier and the Lieutenant Governor exists in a reserved space outside of the control of laws passed by the legislature. (Query: if that construction is correct, why do the Lieutenant Governors give assent to such legislation?). Whatever the correct constitutional construction of the situation, it seems that as a matter of fact, these ‘early’ dissolutions can and do proceed without legal doubt. No-one seems to have asked the courts to intervene, and it would seem doubtful that the courts would do so. By contrast the related April 2017 UK House of Commons dissolution example shows that even if the controlling legislation included ‘safeguards’ such as a requirement for a parliamentary vote, with a 2/3rds majority perhaps, as a matter of raw politics the main opposition party (and perhaps other factions) cannot afford to be seen to be afraid of facing the electorate. In another distinct example, all the Australian states* and territories now have fixed term parliaments, but in cases these arrangements are hard-wired into the written state constitutions, instruments which the UK and Canada and its provinces have not adopted. These fixed term arrangements all include emergency rules for dealing with no-confidence motions, collapsed majorities, blocked budgets and the like. Since the Australian states started adopting these provisions from the early 1990s there have been no extraordinary early elections, although there was the prospect of one in Victoria in 2013.
https://polldaddy.com/js/rating/rating.jsCorrect. The advice that the first minister tenders to the Governors on matters like prorogation and dissolution are indeed not justifiable. Also, the powers and authority of the Queen of Canada and Governors are constitutionally entrenched under section 41(a) of the Constitution Act, 1982, which means that only a constitutional amendment under this unanimity procedure is competent to abolish the established constitutional positions of the Governor and first minister on matters like dissolution in the manner in which the Fixed-Term Parliament Act has done in the United Kingdom. However, fools like Duff Conacher of Democracy Watch has asked the courts to intervene in the case of Harper’s early dissolution of 2008. The Federal Court and Federal Court of Appeal dismissed his claim — *with* costs, I believe, which made the rejection even better. The courts upheld the interpretation that I’m advancing and furthering here. Governors give Royal Assent to such bills because they no longer possess a veto to withhold Royal Assent.